We are so excited to introduce you to the amazingly talented team behind Cinematic Weddings – a boutique wedding cinematography company. The DWS team had the absolute pleasure to work with Cinematic Weddings on our recent video shoot and they produced our beautiful promo video which we are delighted to share on our website. If you haven’t seen it yet check it out here..it is a stunning production and a testament to the wonderful work of Cinematic Weddings. Long gone are the days of hours and hours of wedding video footage. Cinematic Weddings is all about the art of storytelling – they are a team of filmmakers dedicated to their passion and always looking for new ways of telling stories. They take a modern approach to weddings through documentary style story telling which is both poetic and filmic. They will ensure your story will convey an emotional charge which will make the viewing experience not only unforgettable and unique but filled with meaning and magic. Tomek and his team are the amazing talents behind the camera and really go the extra mile for their clients. They are so personal and engaged with each story they are creating and make it their business to capture those little details that reflect their clients unique characters. They are a Cork based team but will travel anywhere in Ireland where they will chat and brainstorm ideas with you over a cup of tea or coffee! We are so delighted to say that Cinematic Weddings will be hosting a Cinematography Masterclass during The Designer Wedding Show which will give you great insight into the world of wedding storytelling and video production so be sure to schedule that in to your diary. We will update with more information about the masterclasses very soon. In the meantime, Cinematic Weddings have just launched their brand new website http://cinematic-weddings.ie/ where you can view a collection of their fantastic work so be sure to check it out and enjoy. 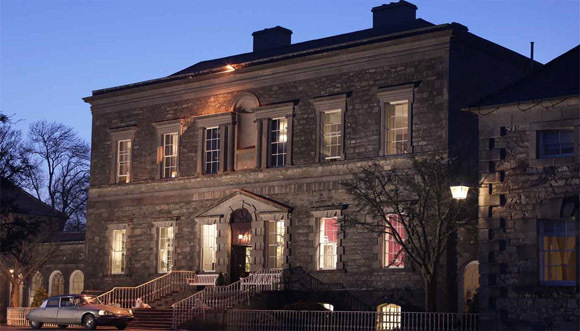 Standing majestically on the banks of the River Boyne in the rolling landscape of Co. Meath, Bellinter House exudes period glamour and is a truly unique and wonderfully romantic wedding venue. The house can be hired exclusively for your wedding day and packages can be tailormade to suit your personal wedding requirements. The Drawing Room & Bar are the focal points of the house where guests can relax in front of a roaring fire and enjoy a snack or afternoon tea. The Bathhouse at Bellinter is so called because of the signature seaweed baths that are a specialty. Enjoy facials, wraps and manicures, then slip in to the Sauna or Steam Room and dip into the heated Infinity Swimming Pool or outdoor hot tub. Bellinter House offers a choice of ceremony rooms for the all important vows, followed by an arrival reception in the Drawing Room of the Main House and dinner in Eden Restaurant. For larger wedding parties, Bellinter offers a beautiful Marquee on the mature Gardens of the house from July – October. Be sure to drop by and meet Lorraine and the team at the show where they can discuss special wedding packages available for this beautiful boutique hotel. We are trying to fit in as many amazing designer profiles as we can over the next two weeks in the build up to the show, to give you a real taste of what its all about. The Designer Wedding Show spotlight today falls on a company that exudes a unique style and quality, one which we are very excited to have attending. Vintage Bride specialises in providing a beautiful range of original vintage wedding dresses. The dresses are sourced from all over the world, and each dress is hand picked and lovingly restored to its former glory. A vintage dress allows you to have a one off dress, unlike any other. From magical antique edwardian dresses to the full circle skirts of the 1950s, the Hollywood glamour of the 1930s to the daring mini skirts of the 1960s, there really is something for everyone. If you hate the idea of looking like a production line bride and want something to express your individuality and flair, then a vintage dress could be for you. Vintage Bride also carry of range of stunning vintage inspired wedding dress that are made to measure. 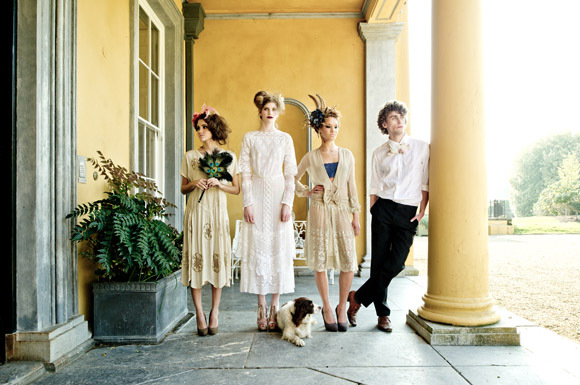 Joanne Fleming Design is a Brighton based designer, exclusive to Vintage Bride in Ireland. The range consists of beautiful vintage inspired dresses from the 1930s, 40s and 50s. All dresses are hand made by Joanne in Brighton using only the finest quality silks and laces. Katya Katya Shehurina is a Latvian designer, whose exquisite dresses echo the 1900s and 1920s. Beautiful laces are layered over silk dresses to create a look that’s individual to you. To complement your dress, Vintage Bride also stock a range of vintage and vintage inspired accessories designed by Jo Barnes. Pamela and her team will be at the event to showcase some of their fabulous collections, on and off the catwalk, so be sure to stop by to take a look. Ps: Check out our Silver Screen Style post for more inspiration ! The Designer Wedding Show is delighted to be able to support Women’s Aid and have them on board as our chosen charity. Planning a wedding can be one of the most exciting times in a woman’s life as she looks forward to the big day and life afterward with the one she loves. Sadly one in five women in Ireland is living in fear of the person closest to them – their husbands, partners and boyfriends. The stark fact is that domestic abuse can happen to any woman, in any home and at any stage in her life. It can happen to your friend, your mother, your sister, or your work mate. The Designer Wedding Show is supporting Women’s Aid in our work to make women and children safe from domestic violence. €1 from each ticket sold to the Women’s Aid National Freephone Helpline, 1800 341 900. 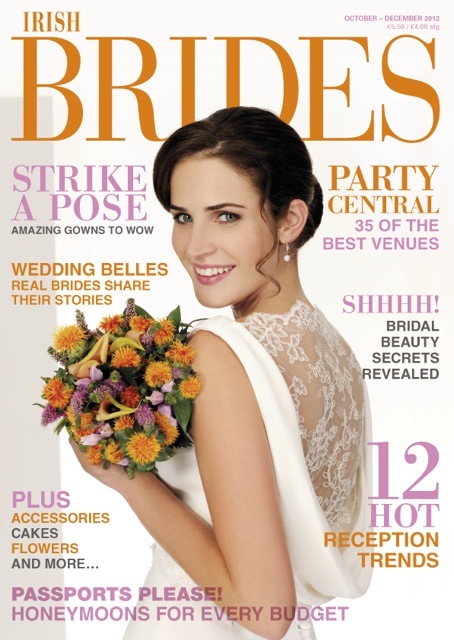 Irish Brides Magazine is THE go-to guide for stylish brides-to-be. Ireland’s most loved wedding glossy, their pages are packed with show-stopping fashion, reception inspiration, practical wedding advice, beauty tips and honeymoon ideas, all from their dedicated team of experts. With 30 years of experience, Irish Brides is Ireland’s longest running and best-informed wedding magazine and knows everything there is to know about planning a sensational and beautiful wedding and each issue is packed with gorgeous, glamorous and on-trend ideas for weddings. We are delighted to announce that all visitors to The Designer Wedding Show will receive a complimentary copy of the latest Irish Brides Magazine with their entry tickets. It’s that time again to introduce another exciting exhibitor who you can meet at the show. Kaleidoscope Bakery is a design-led boutique bakery combining cool and unusual designs with quality ingredients to produce beautifully hand-iced cookies, cupcakes and celebration cakes. Ran by the lovely Kay O’Grady and just over one year old, their client list already includes Brown Thomas and BT2, A|wear, L’Oreal, Stellar Magazine, Movember and many more. At the show you will have the opportunity to preview Kaleidoscope Bakery’s 2013 Wedding Cake Collection, which features stunning contemporary buttercream wedding cakes in show-stopping metallics and unique graphic pastels. 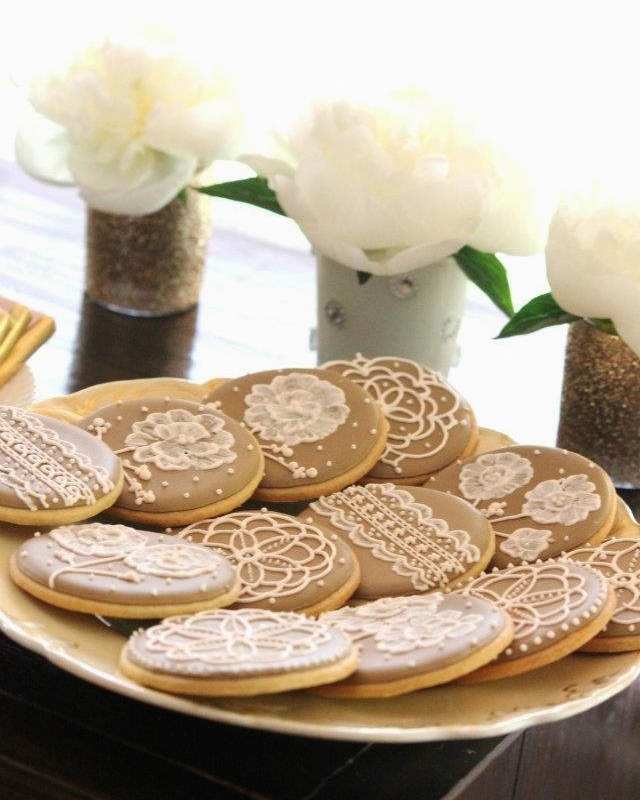 Coordinating hand-iced cookies are perfect as place names, cake toppers, wedding favours and ‘thank you’ gifts – you can even customise a ‘save the date’ cookie! But there’s no point in having gorgeous cookies and cakes if they don’t taste great too, so Kaleidoscope Bakery bakes everything fresh to order and from scratch, always using Irish real butter and free range eggs in their cookie dough, sponge cake layers and fluffy buttercream icing – and even offer free tasting boxes for home delivery so you can see for yourself. Kaleidoscope Bakery worked with us on our recent photo and video shoot to create some amazing cakes and we are delighted you will get a chance to see them at the show! Today is certainly One Fab Day for The Designer Wedding Show as we are delighted to announce sponsorship with OneFabDay.com, Ireland’s ultimate destination online for stylish brides looking for wedding inspiration and ideas. Written by brides for brides, OneFabDay provides daily features on real weddings, bridal fashion trends, planning advice, decor inspiration and diy projects and is the perfect partner for our bridal fashion show. 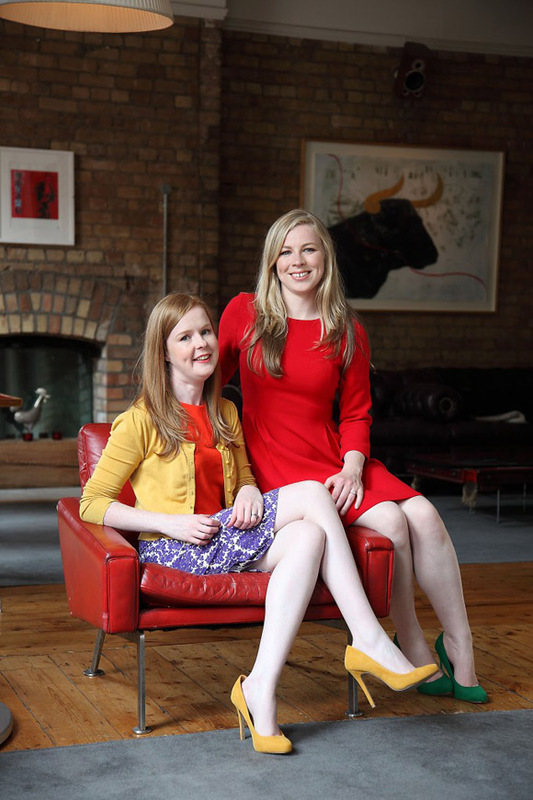 Started originally as a hobby by the lovely Naoise McNally & Susan Gallagher who were both engaged and searching for original, fashion-forward and stylish ideas for their own weddings, in two short years OneFabDay has become the wedding style bible for an audience of over 85,000 unique visitors per month, and a full-time career for both ladies and their growing team. Visitors to The Designer Wedding Show will have the chance to meet Naoise, Susan and the OneFabDay team and we are so excited to reveal that OneFabDay will be hosting amazing masterclasses over the weekend. More news will be revealed on that very soon so please keep an eye on our sponsor page for exciting developments! So the big countdown has started in the DWS office. We are just weeks away from our very first show and we are so excited! We are working with so many amazing wedding suppliers and can not wait to welcome all our brides and grooms over the bank holiday weekend. 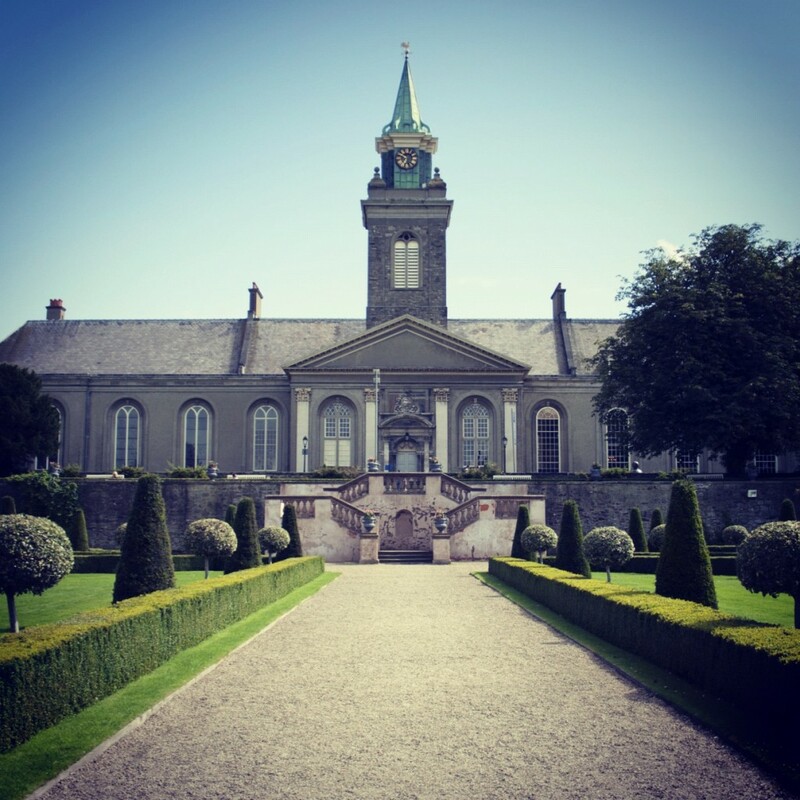 Last week we had the honour to work with some amazing talents in the wedding industry on a photo and video shoot in the Royal Hospital Kilmainham, the fab venue where we will host our show. It was the perfect backdrop for the day and as luck was on our side it didn’t rain once! The gorgeous Pearl & Godiva styled the shoot and brought their unique and creative touch to the day while the very talented Shane O’Neill from Aspect Photography was behind the camera capturing the magic of the day. We then had the absolute pleasure of Tomek and Linda, the passionate talents behind Cinematic Weddings who at this moment are editing hours and hours of filming to create a cinematic storyboard that will be both poetic and filmic. We also can’t forget our fabulous beauty talents, the lovely Derval O’Brien from Ken Boylan Make-Up who created a stunning and understated look for our model and Niamh O’Rourke who not only styled the hair for the day but is also an up and coming millinery talent who created the headpieces for the shoot. We will be doing a feature on Niamh’s millinery over the next few weeks – she is without a doubt one to watch in the world of millinery design! A special mention must also go out to the wonderful Janet from Little White Dress and Suzanne from Myrtle Ivory who kindly supplied us with some stunning Temperley and Claire Pettibone dresses for this shoot. We also had the pleasure of working with two of the most innovative cake designers in Ireland – the talented Iseult from The Cake Stand created a beautiful cake and macaroon pops (very on trend!) 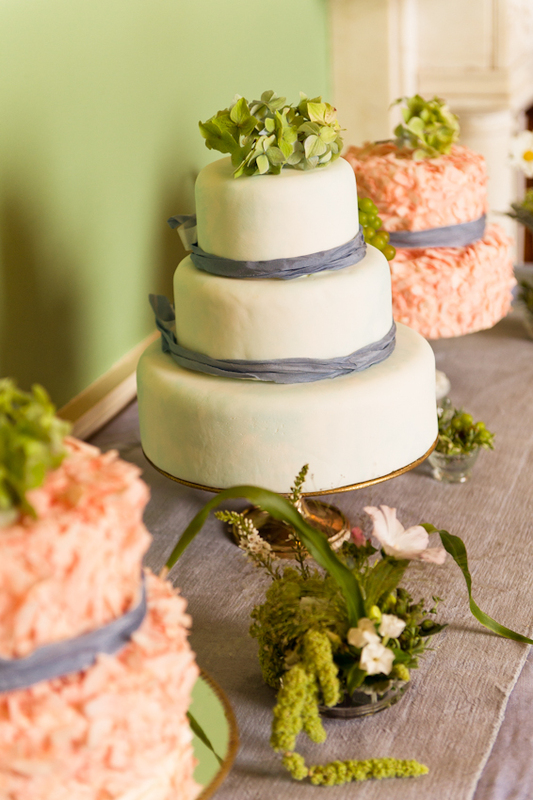 and edgy cake and cookie designer, Kay from Kaleidoscope Bakery created more stunning cakes to add to the perfect backdrop. Be sure to keep an eye on the blog for features on The Cake Stand and Kaleidoscope Bakery coming soon. It was such a fun day working with so many people who are just so brilliant at what they do. Be sure to come along and meet them in person at the show so they can bring their magic to your wedding. In the meantime, here is a sneak preview of some of our photos..
One of the most exciting prospects for a bride-to-be is the prospect of choosing her dress. Every bride wants to achieve the ideal of looking her best whilst also expressing her personality, her style influences and her unique beauty. This isn’t always an easy task, but there are plenty of places modern brides can look to for inspiration. This year the presence of a bygone era on the silver screen provides a bountiful resource for brides. Whether looking to emulate the whimsy of Daisy Buchanan in ‘The Great Gatsby’, the cool elegance of Betty Draper in ‘Mad Men’ or the Edwardian sophistication of Lady Mary in ‘Downton Abbey’, today’s designers provide beautiful interpretations of past styles for the discerning modern bride. 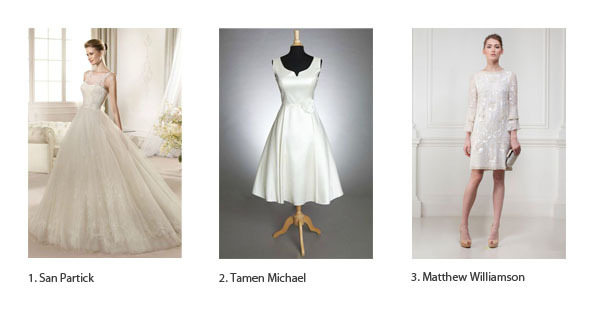 1920’s and 1960’s influences have been evident in many of the bridal collections this year. The sixties really provide a fantastic inspiration for today’s bride. The decade was responsible for a series of key looks; from the miniskirt to sheer fabrics, from psychedelia to cut-outs and of course – the shift dress. Matthew Williamson’s interpretation of the shift dress is pretty groovy. Beautiful delicate material, with striking beading detail evokes the charm and simplicity of the late sixties. Similarly, San Patrick’s high neck lace dress with full skirt harks back to the start of the decade and the end of the feminine fifties. In a completely different way the 1920’s also represented a dynamic time in fashion. Suddenly waistlines dropped and hemlines rose while beading and fringing of sequins, feathers and other surface decorations emerged as de rigueur. A myriad of designers have explored this era exquisitely in their collections – Badgley Mischka’s cream ethereal dress is one such example. 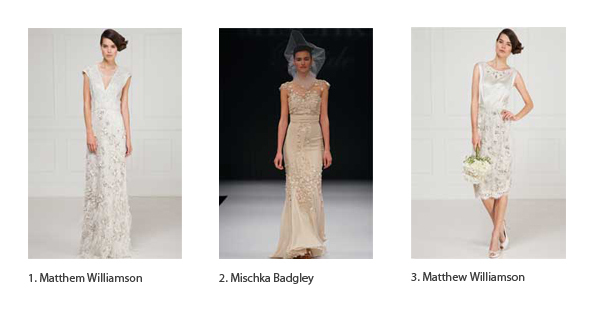 For more inspiration in bridal fashion trends be sure to check out our amazing catwalk show to help discover your perfect style. We are delighted to be able to feature some of the most desired and special wedding venues in Ireland. 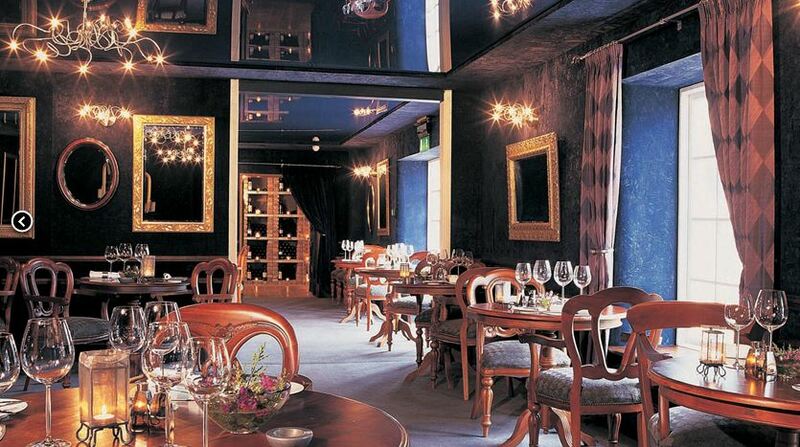 Today we will feature a stunning venue which is not only unique but has a style and charm of its own. This idyllic getaway just one hour drive from Dublin is located in the beautiful garden of Ireland, Co.Wicklow. BrookLodge and Wells Spa is set in Macreddin village surrounded by their beautifully kept grounds, village green and babbling brook. 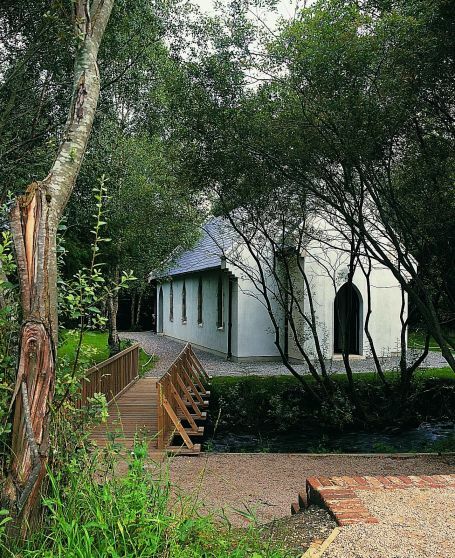 On the grounds is a romantic chapel accessible by a little bridge over Macreddin Brook, suitable for either a Unitarian service or simple blessing or for Civil registration services. BrookHall features the stunning River Room, which can cater for up to 200 persons, and includes its own bar, bedrooms and swimming pool, which is dedicated exclusively to your wedding. Brook Lodge also offers further treats, such as wild and organic foods; their own designated Resort Spa – The Wells; or their Country Pub; Bakery & Smokehouse; their Equestrian Centre; and Paul McGinley designed Golf Course. It is easy to see that this venue is truly unique, offering everything necessary to make your day, the most magical of days. Brooklodge would be delighted to offer further insights into their venue at The Designer Wedding Show on the 27th-28th of October. Until then take a sneak peek at their behind the scenes video.